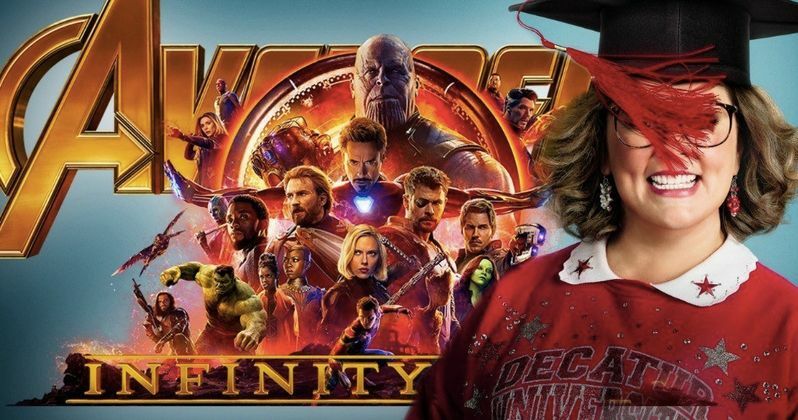 Can Melissa McCarthy Stop Infinity War from Another Box Office Win? While Marvel's Infinity War had no trouble repeating atop the box office for a second weekend in a row last weekend, with $114.7 million, it came up far short of the second weekend record of $149.2 million, set by Star Wars: The Force Awakens in December 2015. Barring a box office miracle, it will also fall short of the third weekend record of $90.2 million, also set by Star Wars: The Force Awakens. While it seems that Earth's Mightiest Heroes are done breaking box office records, it will still have no problem winning for a third weekend in a row, with a projected $60.2 million, easily beating out two newcomers, Universal's thriller Breaking In and New Line's Melissa McCarthy comedy Life of the Party. Our $60.2 million Box Office projection represents a 49% drop from last weekend's final take, which is an improvement over week two's 55.5% dip from Avengers: Infinity War's record-breaking opening weekend of $257.6 million. That mark easily broke the $247.9 million record set in 2015 by Star Wars: The Force Awakens, but that movie had surprisingly minimal drops in its second and third weekends, which allowed the movie to set records in those frames. A 55.5% drop in the second weekend might still be a tad higher than normal, but it's still roughly par for the course for a blockbuster like Avengers: Infinity War to drop about half of its opening weekend in the second frame. The Force Awakens set records by dropping just 39.8% in its second frame ($149.2 million) and another 39.5% in its third weekend ($90.2 million). Last weekend, Avengers: Infinity War faced three newcomers, Focus Features' Tully, Electric Entertainment's Bad Samaritan and Pantelion's Overboard, and while the comedy remake Overboard fared much better than expected, none of those movies debuted in more than 2,000 theaters. While this weekend's two newcomers, Universal's Breaking In and New Line's Life Of the Party still don't have a shot at dethroning Avengers: Infinity War, they will roll out much wider than last week's predecessors, with Life of the Party debuting in 3,500 theaters and Breaking In arriving in 2,500 theaters. Neither Life of the Party nor Breaking In have enough reviews posted on Rotten Tomatoes yet to warrant a TomatoMeter score at this time, but we're projecting that Life of the Party will debut in second place with $24.6 million, followed by Breaking In taking third place with $16.8 million. This weekend also marks a rarity, with both new releases featuring female lead characters. Melissa McCarthy leads Life of the Party, which follows a spurned housewife who heads back to college. And Gabrielle Union headlines Breaking In, about a mom who must rescue her kids from a home invasion. No production budget was listed for either movie, but both were likely produced on rather modest budgets, at least compared to Avengers: Infinity War, and if each movie pulls off a solid opening weekend, they could become two profitable sleeper hits this summer. We're projecting the top 10 will be rounded out by Overboard ($7.8 million), A Quiet Place ($4.9 million), I Feel Pretty ($3.1 million), Rampage ($3 million) Tully ($2.1 million), Black Panther ($1.9 million) and Truth or Dare ($1 million). Avengers: Infinity War will likely have its three-week reign atop the box office come to a close next weekend, though, when it goes up against 20th Century Fox's highly-anticipated Deadpool 2, which has been tracking at an opening weekend of $150 million. The Merc With the Mouth will also go up against the Paramount comedy Book Club and Global Road's comedy Show Dogs next weekend. Take a look at the projected top 10 below, and check back on Sunday for the box office estimates, courtesy of Box Office Mojo.